The offices that would make you LOVE Monday Mornings! What features would make an office amazing? What would increase your working creativity? We made it our mission to find some of the best and most adventurous office designs around. Google’s quirky headquarters in London have somewhat of a futuristic, yet very trendy feel going on. The meeting rooms have large bed like sofas similar to the ones found in the Big Brother House. The corridors that lead to the meeting rooms look like something from a new space age film and the main working areas are very cutting edge. 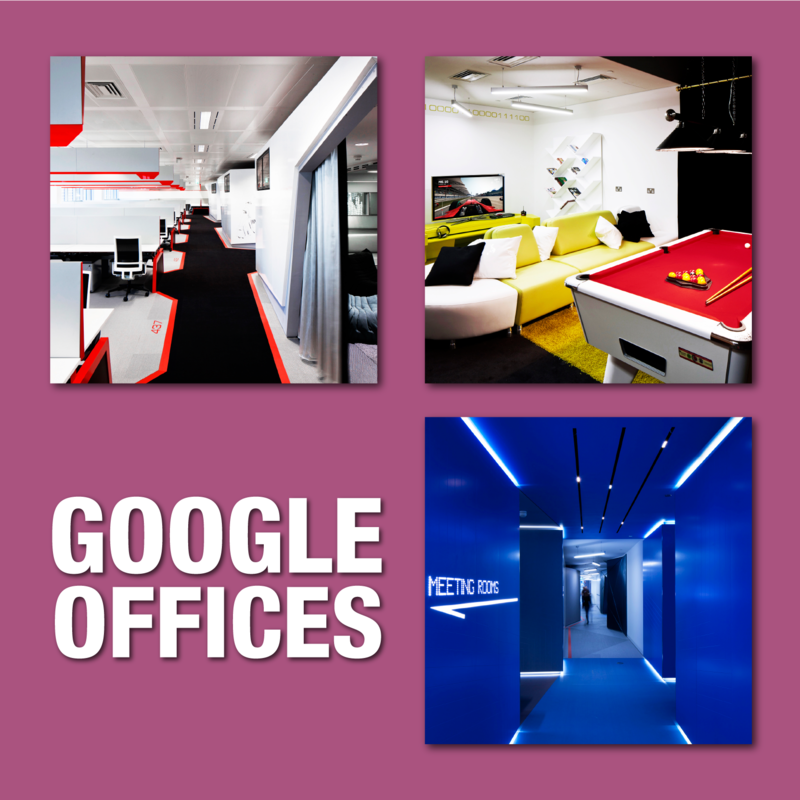 The search engine giants also set out to ensure employees enjoy break time no end with an exclusive games room with big sofas, pool tables and video games galore. 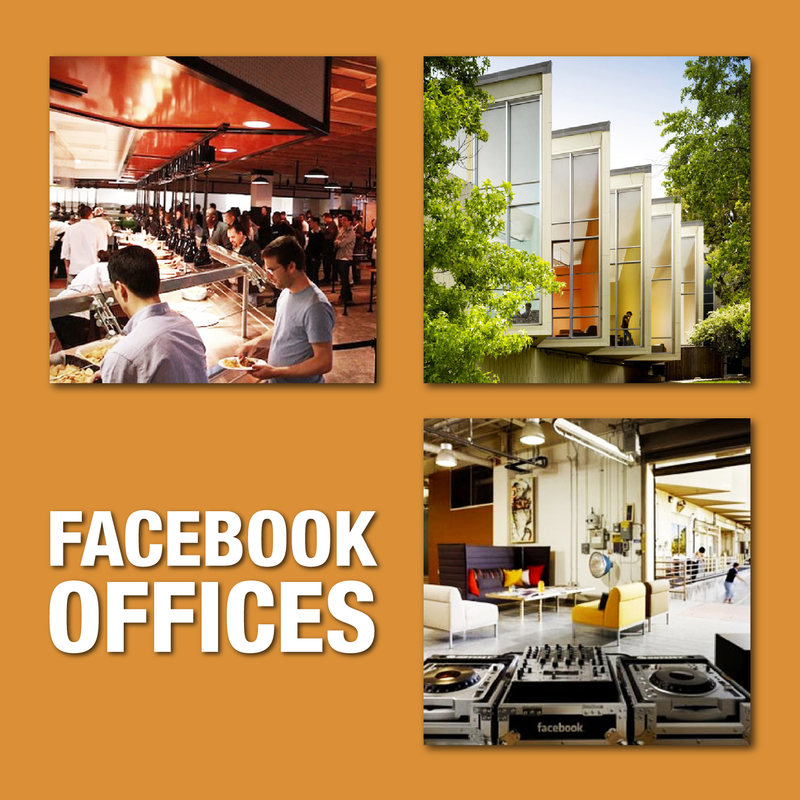 The Facebook HQ based in California provides its staff with free meals, snacks and drinks in their super cool micro kitchens placed all over this unique working complex. Other areas of the building include a music station area with DJ decks and gaming facilities for extreme break times. Facebook took the time before designing their working environment to ask employees what features they would love to see most in the new building. That’s one way to keep your troops happy! 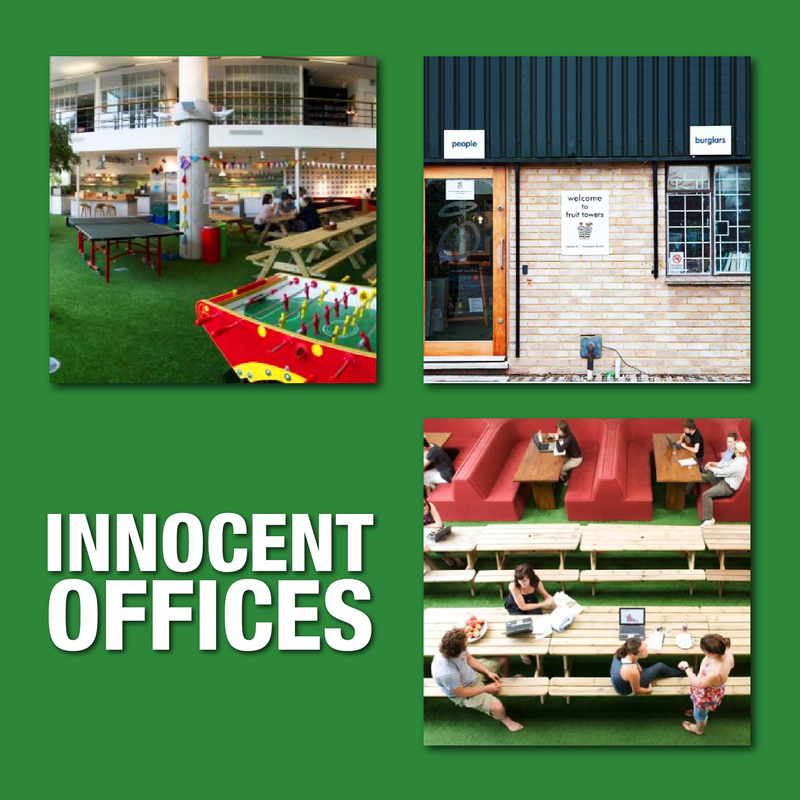 Best known for their yummy smoothies, Innocent Drinks most definitely put a lot of thought into their main hub based in Kensel Rise, London. The look and vibe of the HQ, also known as ‘Fruity Towers’ definitely reflects the natural goodness of the Innocent smoothie. An open communal area with fake grass, picnic benches and soft sofas, give this unique space a real country park feel. Table football and table tennis facilities are also on show giving staff options for a proactive break. 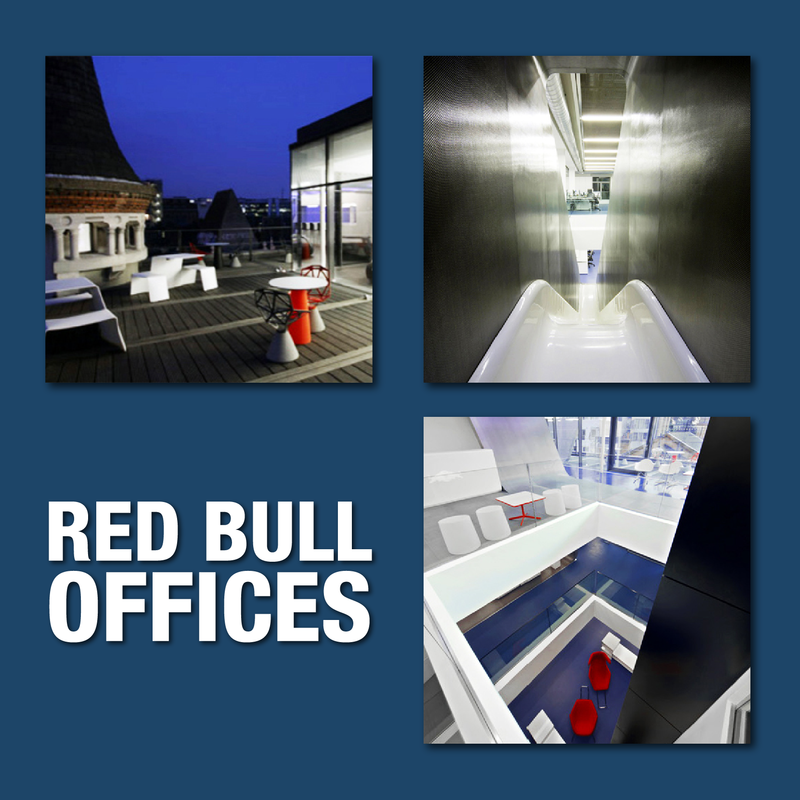 The world’s largest energy-drinks company certainly pushed the boundaries on their mission to achieve a super cool working environment for their employees. Situated in one of London’s busiest and most thriving areas, Soho. The complex has more than a few stimulating features including a giant slide, table tennis meeting rooms, an extremely modern bar & restaurant and a rooftop seating area. You would be forgiven for forgetting you were even at work in this building!!! Youtube have achieved success in breaking barriers to create one of the most awesome working spaces around. 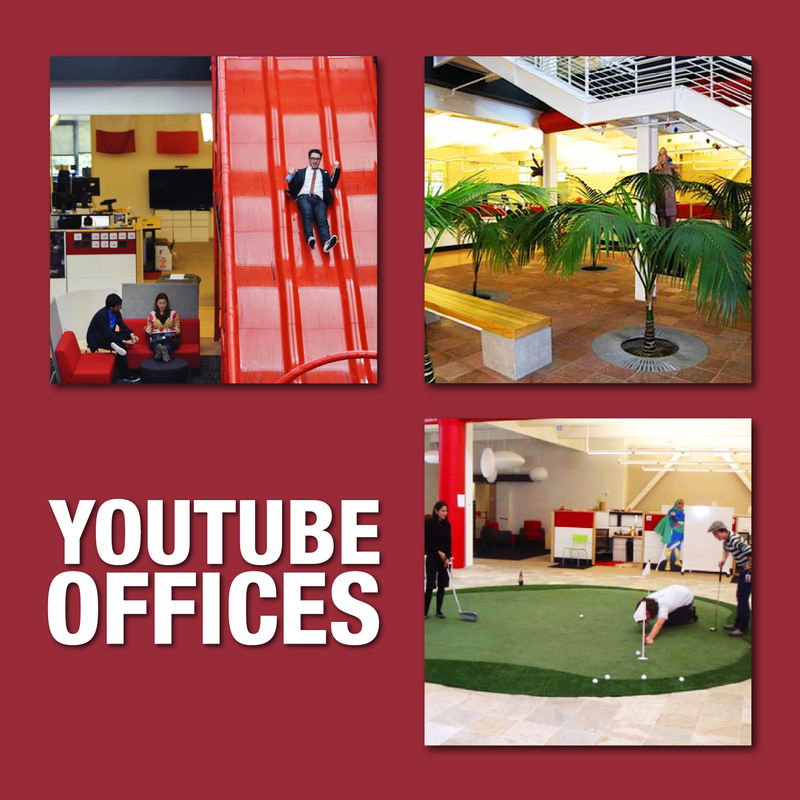 The Youtube HQ offers a swimming pool, fitness gym and mini golf course. A huge red slide has also been installed to ensure no one is late for those important meetings. They appear to have more gadgets and gaming facilities than places to work, a great place to work for fitness fanatics. Who needs a gym membership?